Hands of a well known mystic. It seems like she has a faint/partial spirit line on her right hand. Comments are welcome. What are you referring to as a 'spirit line'? What do you mean by mystic? Wise person? Psychic? Wizard? Psychic. Tarot, numerology, intuitive reading, astrology, perhaps medium. She has her own sort of institute where she invites other psychic's for lectures. She is well know and regarded in the field. zaobhand wrote: Psychic. Tarot, numerology, intuitive reading, astrology, perhaps medium. She has her own sort of institute where she invites other psychic's for lectures. She is well know and regarded in the field. Thanks. Now that you've traced it, I can see what you mean. There are many sure other signs, marks features and lines on her palms of the hands besides the intuition line which reveal pursuing in Spiritual/intuitive activities. Like she has the line of empathy, combined with a simian line and a dominant Jupiter Mount so she is predestined for success as a spiritual leader in whatever belief system she choose to accept. The Lines will go there where the energy flows. The girdle of Venus is adding sensitiveness in the desired field. Vertical lines on the first phalange of Mercury finger making her almost genius in her field. Strong Jupiter mount with small vertical lines there denotes hunger of knowledge. A person of reputation. These marks are giving her the strength and passion to grow her spiritual self. Your particular lines and marks help you connect with your sacred self. A cross on her Jupiter mount mean she has a magnetic way of drawing people in her deepest spiritual thoughts and that she can lead interesting groups that delve deeply into spiritual exploration. Perhaps she has charisma and could make a good living as a chaplain, minister, or other spiritual leader. This mark also denote happy married life. With these marks she could choose to work in human resources management, offering her spiritual gift and services to be a “guide” or a "healer". I believe a triangle especially on the Mount of Luna points to a person with tremendous wisdom and creativity. If you have this mark with other features you are doubly blessed! But I can't see here. 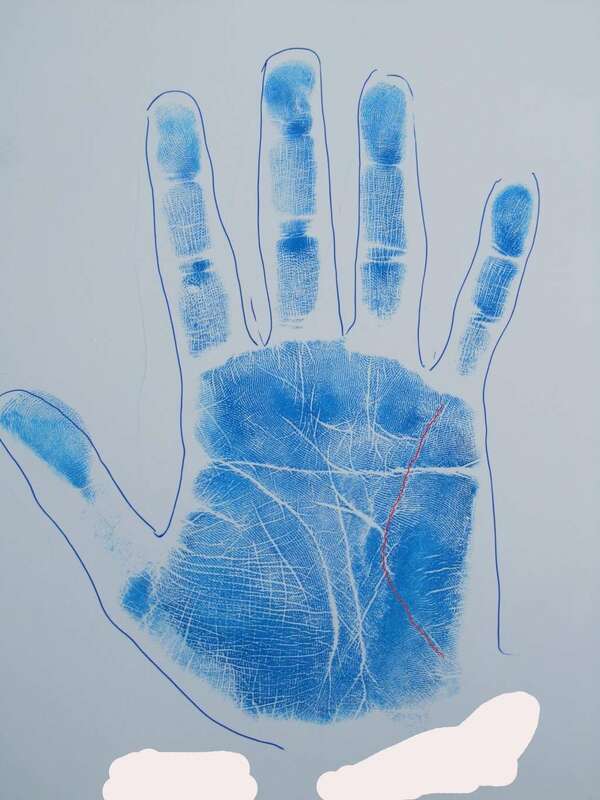 Most deeply spiritual people have psychic or pointed hands, with long, narrow fingers and narrow palms. Does this mean that the square-handed aren't as gifted? Yes they can be too. They have both feet on the ground, quite literally, and are not given to only verbal pronouncements of spirituality. They are quiet, content, and peaceful believers. She is practical too and has a family and children to love and look after them. Fate line suggests she is happy with her work and enjoying. She has consented to have her prints posted here. She is a public figure, leader of sorts, extends herself out to many people, on forums, festivals, conferences and she even produces her own movies on other psychics and topics interest . Recently she has been probing seriously into healthy eating - producing a film on the subject - as she is somewhat overweight, but it is mainly in the stomach due to badly misaligned back for which she has been taking care recently meeting regularly with an osteopath. She has become aware of how reducing processed foods has reduced acidity and her moods. She indeed has a practical side which she combines nicely with intuition. She studied computer science but didn't enjoy working in the field. She is very perceptive, taking smallest clues from people and weaving out an excellent story. She could also be accessing information not through the regular senses, but "skeptic" me hasn't seen definite proof yet. She has a boy now in his early 20s whom she seems to like a lot. She is not married. She seems to be very open about her life, and admits to having been compensating for lack of love for many years. She is living in a rather modest apartment in a modest part of town. She talks often about money/'taxes' issues scraping bit from here and there to possibly make ends meet. But she doesn't seem poor nor the disposition for it. Overall she seems happy and content with her work. She is kind person in many ways, though she does have very slight touch of bitterness to her personality. The contrast of the (faint) spirit line showing on square hand is interesting. Patti, I believe she has the tented arch under ring finger - teacher - right hand. Could you please confirm. It fits her very much. She can't help but sharing her knowledge. Also it seems like she has this hugely wide humor loop on left hand. Has anyone seen this before? zaobhand wrote: Patti, I believe she has the tented arch under ring finger - teacher - right hand. Could you please confirm. It fits her very much. She can't help but sharing her knowledge. Also it seems like she has this hugely wide humor loop on left hand. Has anyone seen this before? The looping/recurving ridge at the core is actually between the ring and middle fingers. But, all the other looping ridges pass from one side to the other of the ring finger. Technically, it isn't a tented arch, but the energy of the pattern, in my opinion, is nearly the same. I add the responsibility energy to the teaching energy. I think it relates to a strong sense of duty to one's self. This person would feel badly when they let themselves down. When the responsibility loop is more centered a person feels bad when they let others down. Those are generalizations and most people relate with or without responsibility loops, but I think the loop emphasizes the impulse. zaobhand wrote: She is very perceptive, taking smallest clues from people and weaving out an excellent story. She could also be accessing information not through the regular senses, but "skeptic" me hasn't seen definite proof yet. I think you've summed it up pretty well here. Studying her prints I got the sense that she literally in some way physically picks up on another person's nervous system - or vibrations. Her empathy lines are not deep, so she's not at the mercy of other people playing on her sympathy or empathy. 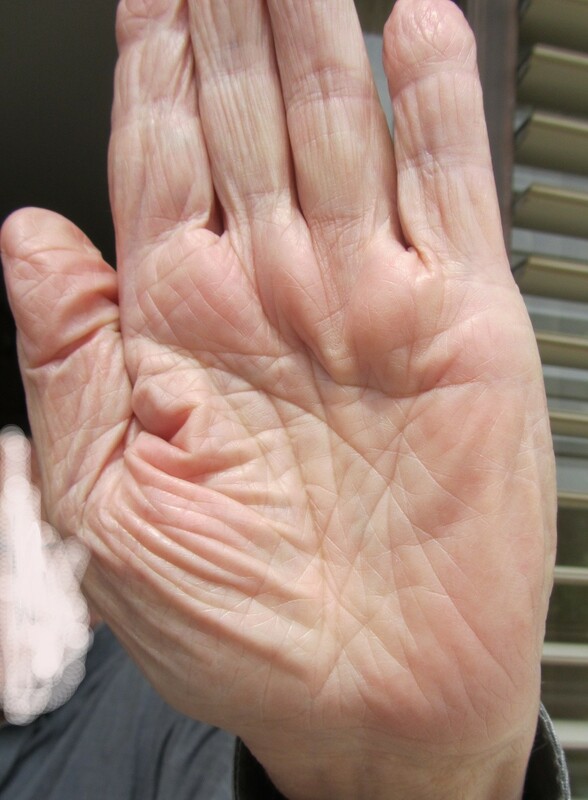 Fine lines make basketweave patterns on her thenar mounts and there are patches of fine lines across the upper hypothenar among other locations. This is all like a superficial circuitry board that connects to 'stomach'. (which might have many related reasons why it has become the area enlarged). She has some not so common dermatoglyphics, too. 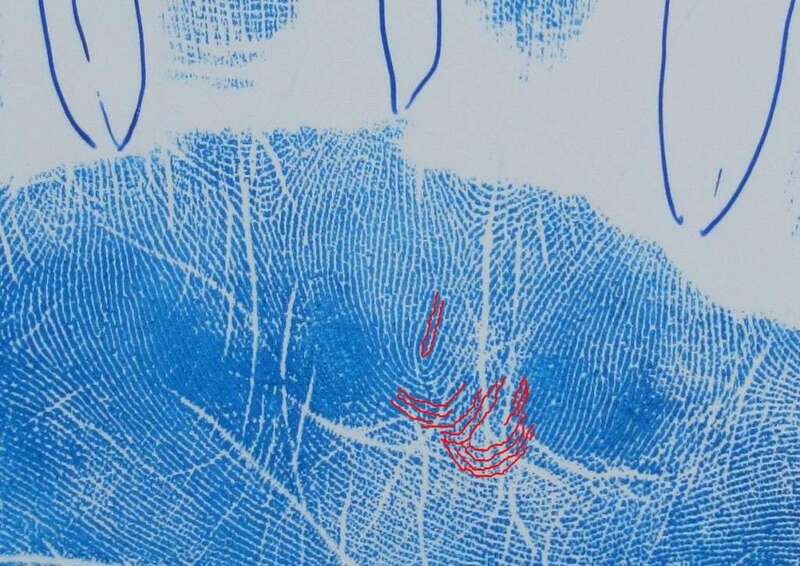 Her middle finger prints appear to be a double loop on the right and a oddly formed double loop or peacock on the left. I can't tell from the print if there is a complete circuit of a loop in the center that would make it a peacock. A peacock would be very rare here. (.8%) 1.75% would have the double loops on both middle fingers. There is an interesting wave to the ridges around the heart line under her ring finger flowing on to the ulnar side. The triradii under the index finger on her left hand is placed radially and not centered under the finger. Her main creases have fine markings on them, little triangles and feathery tiny short branches. Like she's sprouted antenaes everywhere. She must use this energy for her psychic work, but for many others we'd feel stressed or drained. An analogy came to mind thinking about how she does her work. If you think of getting goosebumps and those goosebumps only come with one familiar sensation and one result in general for most of us... She probably gets sensations from all over her body and particularly, gut feelings, and just knows how to interpret all of it. Just as you said. Raman, if you are reading this, notice the deeper grill on the thenar mount on the right hand. In the left see how in the same area the grill pattern seems to center into this area. Hi Patti, Is this what you mean by loop between ring and middle? Very subtle. There seems to be somewhat similar loop between the ring and pinky finger, only longer. Both loops tightly flanking the ring finger. Almost like an interference pattern (as in waves). Interesting analysis! It does seem like a peacock on her middle finger of left hand. The core however is made of only 1 or 2 ridges. Yes, that's it, but I don't see the one you are describing between the ring and little fingers on either hand. Patti wrote: Yes, that's it, but I don't see the one you are describing between the ring and little fingers on either hand. Unfortunately the print is not clear there. I followed the lines that emerge from between ring and pinky, and used their traces at the crest to create the partial humor loop. The two crests of the waves are sketched. It is like throwing two stones into a pond and the two waves are interfering with each other. - What could the wave pattern under Mercury and Ring finger ringer represent? The information would travel longer, more processing of certain type. - The double loop on middle finger makes sense in light of her movies on various cultural and mystical subjects. - Any significance for the peacock on middle finger? I also have one.. I'm not sure that there is a second loop there where you've drawn it. I think the ridges narrow down and continue under the ring finger. I don't think there's been anything written yet in regards to the flow of ridges in a field except that Cummins & Midlo pointed out that it was significant to take note when ridges narrowed or increased as they flowed across the hand. My guess is peacock on middle finger is that you will have protection when a need for mentorship or responsibility comes in, kind of some support. Are you then describing fingerprints as symbolic and representative of outside influences? zaobhand wrote: The contrast of the (faint) spirit line showing on square hand is interesting. - Notice the curving little finger at its end, while the other fingers have a squarish ending. ( As per my understanding this also adds to the spiritual nature of the subject). - The the little finger is relatively more thin compared to the other fingers. Also, the line of intution is appearing only on the left hand. How to interpret this?! In the sense - how to differentiate the way its used by the subject, if it was only on right hand or both right and left hands?! Readers- can you please comment on this last question? I was asked privately and would like to clarify the sentence "She is not married. She seems to be very open about her life, and admits to having been compensating for lack of love for many years.". I meant to say that she seems rather unhappy about the lack of love/romance in her life. Compensating with her activities, eating etc. That is all. No suggestions as to her 'moral' conducts. Thanks. Hi Patti, what do you think is the significance of the grill here or in general? ask your friend to read this article from Jennifer's website: http://cheiro.co.za/body-weight. You too may have a look at this article. Its regarding body weight of healers. It can relate to things like acid reflux, indigestion and heart burn. 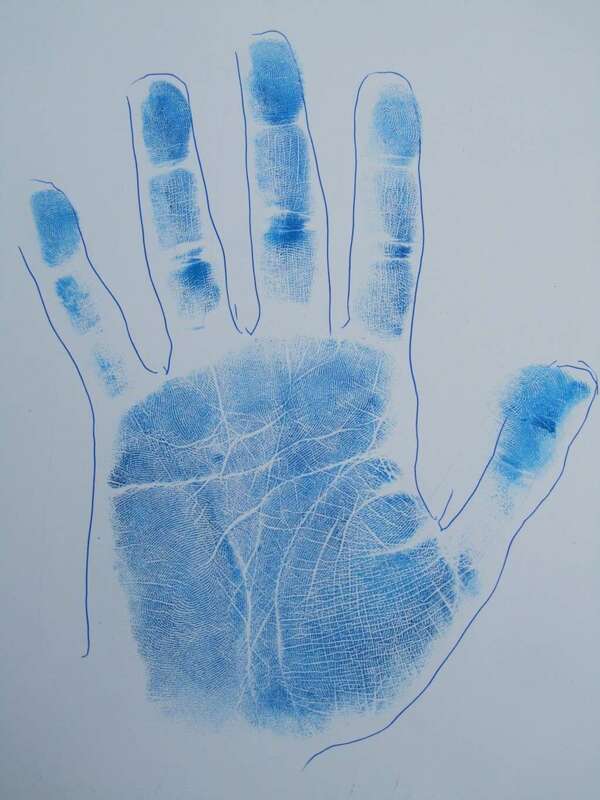 regarding your question " Are you then describing fingerprints as symbolic and representative of outside influences". In some sense there may be symbolic interpreation is what i have read iam not sure what you mean by outside influences. What i noticed is people who have peacock seems to have protection, so i extended the answer to the middle finger. I do have seen few people getting some sort of protection when they have peacock fingerprints. Probably people who hav done more reading can give me better facts. I have not based this on scienfitic facts but few very data points. so still my interpreattion can go wrong. But there has to be collection of facts. Regarding your question, from a scientific point of view the zone of appollo, thenar zone and mecury zone come under passive zone or subconscious zone (charlotte wolfe book human hand), and other zones come in under active zone or conscious zone. Whether it is left or right hand the zones are all subconcious zone. Now in a right hand if the line is in righ hander the subconsious would be activated more in his active part of life but yet there would be somethingh which would be subconcsiusly working when he is doing a lot of thinking ect... in case it is in left hand for person it would be more dream based is what i can think. This is how i would start off, but still if others give input it would be great. Active and passive zone is what i would start off in active and passive hands. http://www.cosmicharmony.com/Av/Nityanan/Nityanan.htm when asked about his stomach, he said it was due to absorbing the karma of other people (healing). Apparently it is said that he ate very little if at all. Would you consider this as in intuition line? He is 87 years old. I asked him about this. He said he had such capabilities since he was a boy. He promised to tell me more about it in private.